Glenavon manager Gary Hamilon. Pic by INPHO. Glenavon will visit The Brandywell determined to secure another three-point success on a 3G surface - however, there is nothing artificial about manager Gary Hamilton’s admiration for rivals Institute. The Lurgan Blues will get back into domestic duty after the international break by visiting newly-promoted Institute aiming to maintain the encouraging start to the Danske Bank Premiership campaign. Institute manager Paddy McLaughlin. Pic by INPHO. A tally of 10 points from five league fixtures has left Glenavon with a promising platform. 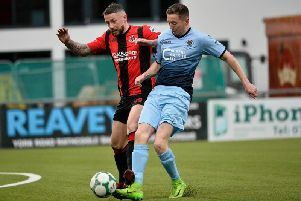 Institute can point to a mixed return of two wins, draws and defeats over six senior appearances - but the successful overall transition from the Bluefin Sport Championship drawing praise from Hamilton. “It used to disrupt our preparations and momentum but I think we managed to go unbeaten on 3G surfaces last season,” said Hamilton. “However, we can expect a tough test against an Institute side without defeat at The Brandywell and not having even conceded a single goal. “I watched Institute against Cliftonville and they were excellent, with some really promising play in a defeat when the scoreline did not reflect the performance. Glenavon’s youth boost arrives with some drawbacks, however, in the area of game management. Institute manager Paddy McLaughlin is fully focused on Saturday despite speculation this week linking him to the Coleraine manager’s job. “It’s what they (the players) do out on the pitch that gets people saying good things about me as a manager,” said McLaughlin. “We have been on a great journey over the past 18 months and I don’t want that journey to end now. “Everyone at the club has worked their socks off to get us to the Premiership. “We are a tight unit and I would like to think I am part of that unit and I see no reason to change that now.